For Detective Danny Clover, Broadway is more than just a street - it's a living, breathing creature with a mood and a style all its own. 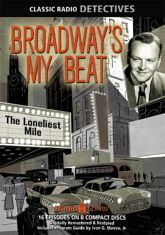 Radio's most lyrical crime drama comes to life in this 8 CD collection of Broadway's My Beat, featuring sixteen unique tales of murder along the main stem. The series' purple prose is counterbalanced by the gritty realism that was a specialty of the 16th Precinct and its endearingly eccentric characters. Larry Thor stars as Clover, with Charles Calvert as Sgt. Tartaglia and Jack Kruschen as Detective Muggavan. The voices of the violent and their victims are provided by Betty Lou Gerson, Sheldon Leonard, Paula Winslowe, Howard McNear, Paul Frees, Larry Dobkin, Cathy Lewis, and more.